Our new Priest in Charge, Fr. Francis Abara, will be visiting the school regularly. He is becoming a familiar figure and, together with staff, arranges prayer services for Key Stage 1 and Reception, and class Masses for Key Stage 2. These usually take place in school although on special occasions Years 3-6 celebrate Mass at Holy Cross Church. Class Masses are organised on a rota basis with each class taking a turn to prepare the liturgy. During Lent, we have penitential services for Key Stage 2. You are always welcome to join us on these occasions, to share in the celebration of the Eucharist and to help the children understand better the idea that they, their parents, teachers and visitors all belong to God’s wider family. Each day we have a school religious assembly, and from time to time your child’s class is involved in preparing a school assembly. You are warmly invited to attend this to share the children’s work, their creativity and to give praise to God. Our RE programme is based on the “Come and See” scheme. 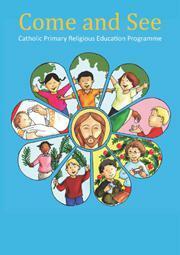 This is a new Catholic Primary Religious Education programme for Foundation and Key Stages 1 and 2 published in July 2012. This easy to use, teacher-friendly material has been written by a group of experienced diocesan advisors. When your child reaches Year 3 you are invited to participate in supporting them in a programme leading to the Sacraments of Reconciliation and Eucharist, which is organised by Catechists in the Parish. This involves you making a formal commitment, to ensure your child attends regular meetings as well as Eucharistic celebrations in preparation for these Sacraments. All children receive some instruction in school, but the actual celebration of their Reconciliation and Eucharist is Parish based. The spirituality of the school is enhanced further when the children visit the Prayer Garden and when they are led in the act of Meditation. The Prayer Garden was officially opened by Fr. Jim Boothman in the summer term of 2014 where he blessed the garden and the school. Both children and adults appreciate the calming environment that the garden offers in which they are welcome to lead themselves in a personal act of worship and/or meditation. The Prayer Garden is a place that enlightens the senses through the smell of the herbs and flowers, the sound of the wind chimes and water flowing, the feel of the prayer stones and the aesthetically delightful design of the garden. We are extremely proud of the Prayer Garden and we have recently used the garden as a memorial for Remembrance Day where we replicated the poppy installation at The Tower of London. Meditation takes place in every class including our youngest children who are 3 years of age. The children enjoy the act of meditation and express an amazing calm and reverent attitude when they are involved in this act. Meditation begins with reflective music being played which then leads into a story being read based on Gospel values. The children are then led into the act of meditation where they focus upon the reading and reflect upon their own lives. Meditating is important as it supports the emotional development of our children. Children celebrate their Class Saint's Feast day by either attending Mass in Holy Cross Church, or having an assembly or Class Liturgy. In this way children learn more about the saints and their lives.